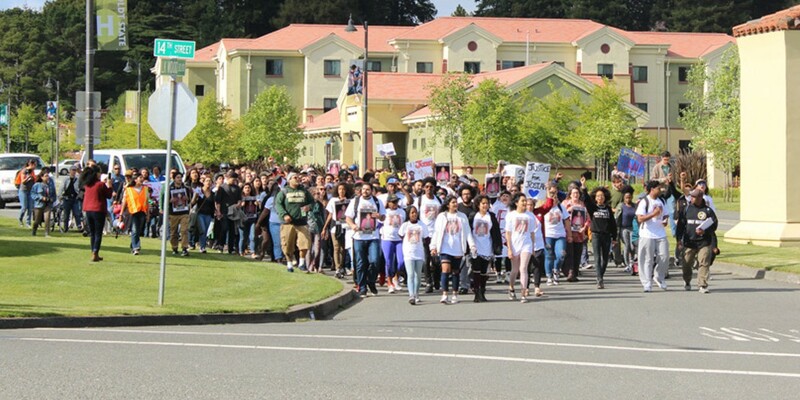 Thadeus Greenson Protesters march from Humboldt State University to Arcata City Hall, demanding "justice for Josiah" Lawson. 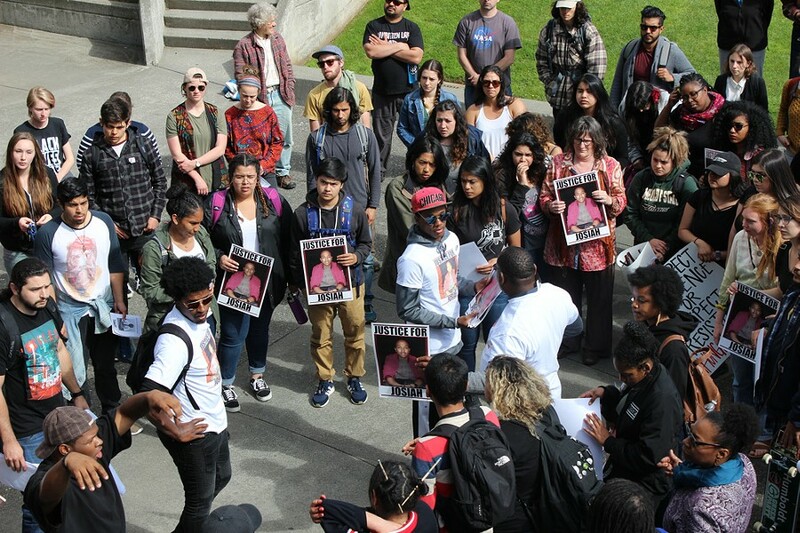 Thadeus Greenson Demonstrators gathered at the Humboldt State University quad before marching to city hall. It's been with great sadness and a lingering sense of hope that I've watched news of David Josiah Lawson's killing and its aftermath reverberate through Humboldt County. 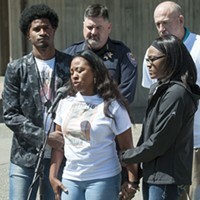 No matter what happened at a Spear Avenue house party on April 15, the violent death of a 19-year-old Humboldt State University sophomore should be cause for honest reflection, but I'm seeing far too little of it. Having covered Lawson's stabbing death and the ensuing case against his alleged killer, 23-year-old Kyle Christopher Zoellner, I probably know more than most about what happened in those pre-dawn hours. But I have no idea who killed Lawson or why. Witness testimony is grossly inconsistent on what happened that night and, even ignoring the inconsistencies, nobody has come forward to definitively say they saw Zoellner stab Lawson or even that they saw a knife in Zoellner's — or anyone else's — hands. As of the moment a murder charge facing Zoellner was dismissed May 5, there wasn't a shred of physical evidence connecting Zoellner — or anyone else — to the stabbing. As dissatisfying as it is to say, I don't know what happened to David Josiah Lawson. I don't know why he was killed or who killed him. And — if we're going to honestly discuss his death and what it means — I believe that's a premise we all need to start from. If you disagree because you witnessed Lawson's killing and have so far remained silent, then you need to put down the paper or whatever device you're reading this on and go speak to the police. That's not a matter of snitching or informing, it's simply what living in an open nation of laws demands of you. The rest of us should recognize that — suspicions aside — we know very little. But reading through the comments of public officials, witnesses and average folks — in media statements, online comments and social media posts — I find myself stunned at how sure everyone is. Depending on who you're listening to or reading, this was a hate crime or a case of reverse racism, an example of the generations-old systemic prejudices that still exist in our country or a portrait of new, post-Obama era entitlements, uncomplicated by other factors. It's understandable but also disappointing and limiting. All of us in this community need to recognize that we're seeing this case — and really everything around us — through the lens of our experience, with the bias that carries. With that said, let me tell you a bit about my life experiences and the lens they have left me to see the world through. Humboldt County is the whitest place I've ever lived. By far. To be clear, I love it here. It's my home and my daughter's home, the only place she will be raised. And, if we're still being forthright, that sometimes tears me up inside. That's not because I distrust or dislike white people — I am one and count many among my friends — or because I suffer some guilt at the atrocities that people who look like me have carried out against a multitude of people and cultures, both at home and abroad. Nope. It's because I believe diversity inherently enriches communities, that multiculturalism is a cornerstone of this country's ideals and its potential. My life is richer because I grew up in the melting pot of the Bay Area, exposed to an array of cultures, and she will be robbed of that. I was born and raised in Oakland, the child of solidly upper-middle class parents with a devotion to social justice. My father marched with Martin Luther King Jr. and helped start the free speech movement in Berkeley, and my mother moved across the country to learn to care for people with mental illness and fight for women's right to educational and professional advancement. For years, beginning at the age of 6, I was the only white kid — or one of only a couple — on my West Oakland baseball teams. I fell in love with — and eventually married — a woman who is the daughter of a Mexican immigrant and a second-generation Mexican American. I followed her to Mexico, where we lived for a year in an idyllic town that counted me among its few white residents. This is to say that in some of my 38 years on this planet I have experienced being the other, the person who is immediately recognizable as different from the rest. I found these experiences to be alternately intimidating, exhilarating, interesting and, well, scary. Now, I am keenly aware that I say this as a straight white male, as someone who because of my gender, my orientation, my skin color and my family history, was spared many of the systemic challenges that face other people growing up in this world. Every time I experienced being the other, after all, I returned to an American culture that historically favored straight white men and still does. When my wife and I arrived in Humboldt County shortly after our wedding, we squirmed in the living room of an acquaintance as she described one of her softball teammates, explaining that the girl's speed was due to the fact she was Mexican and grew up running from the police. I'll never forget that moment and the stomach-turning feeling it induced in me. Comments I've heard in recent weeks about Lawson's killing — and some of its coverage in the media — have invoked similar, if stronger, feelings. But there have also been some moments that have left me hopeful. I got a phone call from a middle-aged guy last week. He grew up in Arcata and said he was about 8 when he met a black person for the first time, admitting that he was shocked when the color of the man's skin didn't rub off on his own when their hands touched. The man said the diversity Humboldt State University has brought to Humboldt County is a good thing. 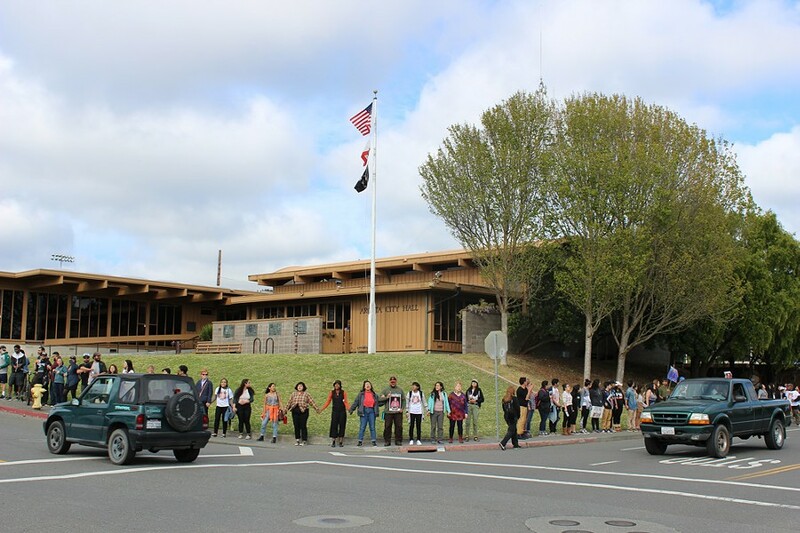 Also last week, I watched as protesters gathered in front of Arcata City Hall to demand "justice for Josiah," forming a human chain that, arm-in-arm, encircled the building as they chanted loudly. As the crowd chanted, "No Justice, No Peace, No Racist Police," Elijah Chandler — a friend of Lawson's who became somewhat of a lightning rod in the community after he very publicly accused police and emergency medical technicians of a racially prejudiced and unprofessional response to Lawson's killing — stepped in. He grabbed the megaphone, urged positivity and led the crowd in a renewed chant that dropped the last phrase. 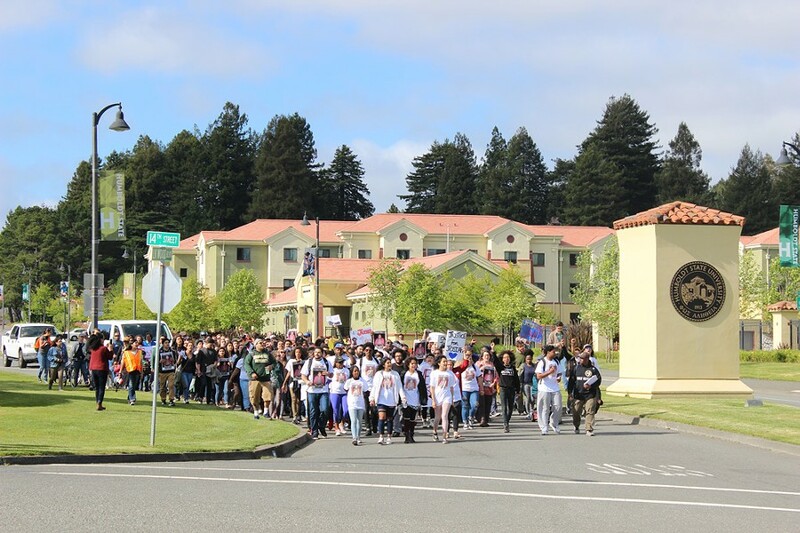 At that same rally, I spotted University Police Chief Donn Peterson handing out water to protesters, saying later that he wanted his students to feel safe and supported, despite the fact that one of his officers was among those accused by Chandler and that some protesters' ire has been directed at his Arcata colleagues. 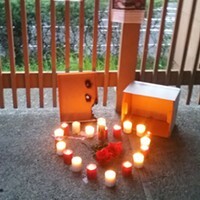 Like the demonstrators who filled the streets of Arcata last week and stood sentry outside the Humboldt County Courthouse as Lawson's family met with Humboldt County District Attorney Maggie Fleming, I, too, want justice for Josiah. I want his killer to be found and held to account by the laws of our state. But my life and years of reporting have also taught me that true and complete justice won't be found in a courtroom. If we as a community truly want to find justice for Josiah, we need to begin with ourselves. We need to recognize the personal lens through which we see the world and question it, challenging ourselves to see life behind the Redwood Curtain as someone else might. Now, I understand that's hard for some, whether they've been here for decades only to see the county change before their eyes or they're fresh off the bus at HSU, realizing they've just landed in the whitest place they've ever lived. In many ways, it can seem daunting. But my life has also taught me that change is incremental and simple acts of kindness can have lasting impacts — the kid who asks another kid who looks different from the rest to play catch at baseball practice, the young woman who invites the foreigners to make mole with her family and, perhaps, the police chief who stands with protesters in a show of support. Again, I don't know what happened to David Josiah Lawson. But I do know that since his death I've heard a lot of people say they don't feel safe here. I believe them. And as the husband of a brown woman and the father of a brown girl who I want to give every opportunity in this life, that tears me up inside and I want to change it.